Undocumented students explain how DACA benefits them at PCC forum, and argue for its reinstatement. Portland undocumented students known as "Dreamers" emerged from the shadows Wednesday to share their stories, as their fate in this country was debated in the U.S. Capitol. 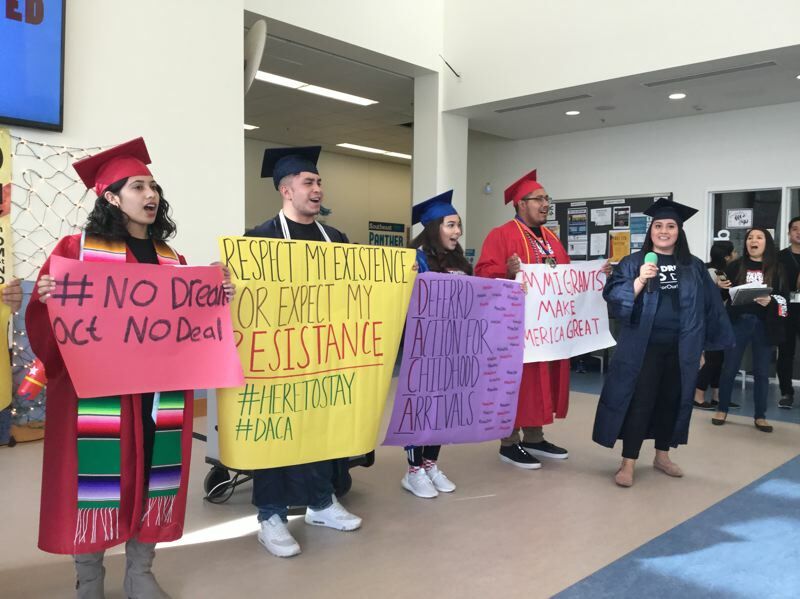 One by one, seven Portland Community College students registered under the imperiled Deferred Action for Childhood Arrivals program pleaded to reinstate the program, at a student-led forum at PCC's Southeast Portland campus. "I'm considered a criminal because I was born in another country," Ana Maldonado, 19, told the audience of about 50 people. Her parents brought her to this country when she was in the fifth grade to escape violence in their Mexican village. Though she initially didn't speak English, Maldonado managed to finish high school earning mostly straight As. 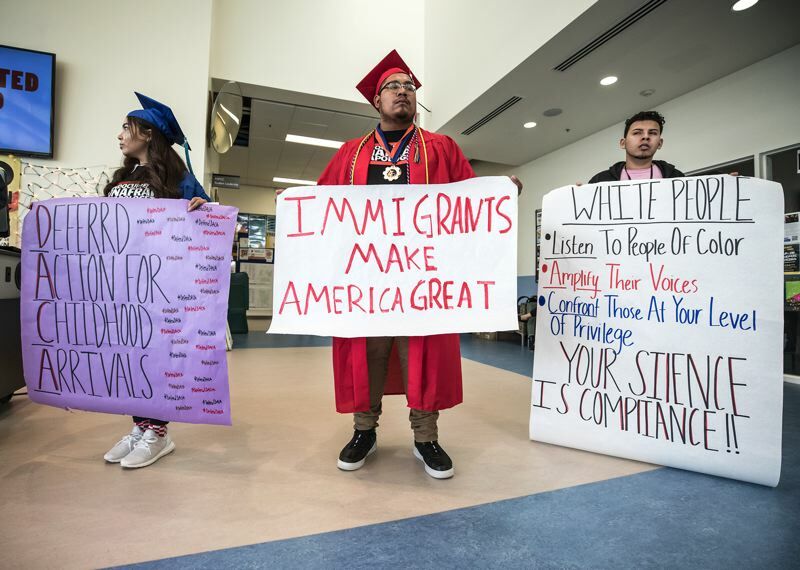 Before the DACA program, Maldonado and the others were barred from working and getting a driver's license, and couldn't get student loans to pay for college, even though some of them had significant scholarship offers. DACA, which granted undocumented students expanded rights and temporary reprieves from deportation, was enacted by former President Barack Obama as an executive order. President Donald Trump ordered the program canceled last September, giving Congress six months to pass a replacement measure. If Congress can't or won't do that, an estimated 690,000 recipients are vulnerable to being deported, along with their parents. "I'm not asking you all to feel sorry for me," Maldonado said. "I'm asking you to recognize that people like me matter. We're not criminals. We love our families. We want to be successful. Now more than ever, we need everyone's support. We don't want to steal anything from anyone." As the students spoke, U.S. House Democratic Leader Nancy Pelosi has just finished an eight-hour marathon speech on the House floor, where she read stories of other DACA recipients, also known as Dreamers. 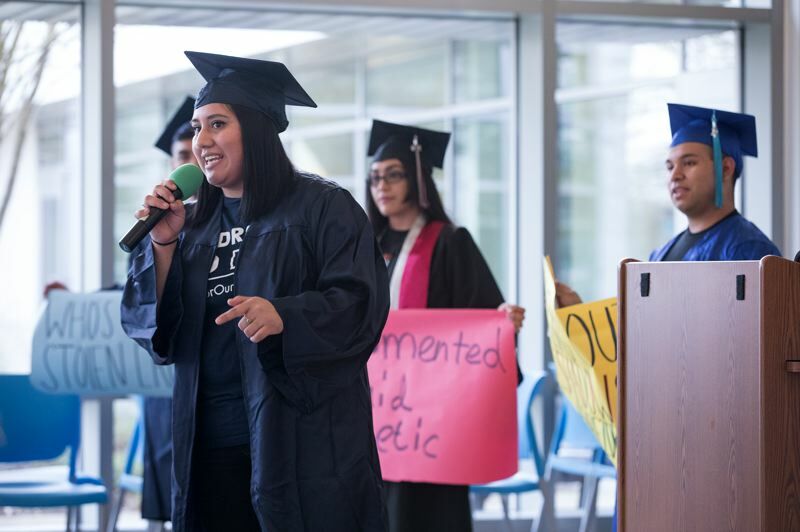 "I'm a DACA recipient and it is not easy to tell your story," said Petrona Dominguez, who works as a Dream Ambassador at a new DREAM Center opened at PCC Rock Creek to provide referral and support services for DACA recipients. 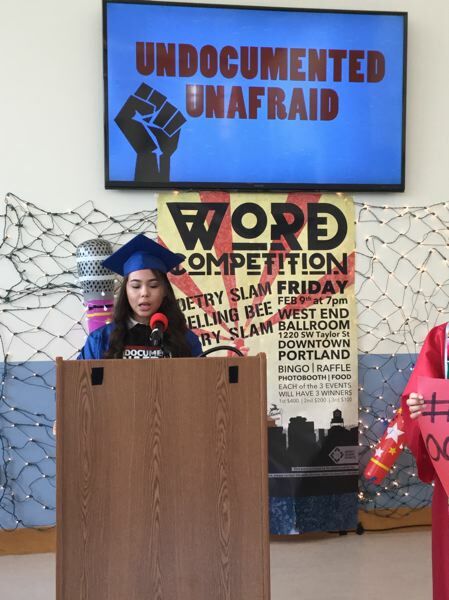 "These stories are very hard to say," Dominquez said, before leading the audience in chants such as "Up, up with education; down, down with deportation." Alfredo Reyes-Avila, who also was born in Mexico, was brought to the U.S. back in 2005, when he was in 2nd grade. Reyes-Avila said he didn't realize he was being treated all that differently until he got older, then realized he couldn't get jobs like his peers. Nor could he get a driver's license. When he got a $42,000 scholarship offer to attend the University of Portland, he couldn't accept it, because he couldn't fill the remaining gap with student loans. "DACA has really changed my life," Reyes-Avila said. "Thanks to DACA, I have been able to obtain a job; also, my drivers license too." He also can travel the world. Like others, Reyes-Avila said he owed a special debt to his parents, who struggled to bring him here so he could get an education. "We want to make our family proud," he said. But if DACA expires, "We'll be kicked down into the dirt, hidden in the shadows again." Jorge Trujeque, from a village in the Mexican state of Yucatan, said he sees the same features in his face that he sees in others living here. "Sometimes I ask myself, since when did we become aliens?" he said. "I refuse to be called an alien or an illegal, because my documentation in this country does not reflect the person that I am or the person that I will be." Trujeque challenged critics to get to know him. "For those who are against DACA and the Dreamers, please let's have a sit-down conversation and tell me what the difference is between me and you, because dreamers bust their asses trying to accomplish things that other people have handed to them. We see no borders; we see stairs, because every opportunity we see, we climb up to get it. "I am not going back into the shadows."